Morning temperatures will settle in the 60s and 70s as it will be partly sunny with a blend of sun and clouds Tuesday in South Florida. Areas of smoke from a wildfire may affect the morning drive near US 41 and Southwest 137th Avenue in Miami-Dade. Highs will peak in the low to mid 80s. The atmosphere is dry so the onshore breeze is not expected to produce many, if any, showers, and shower chances are under 10 percent. 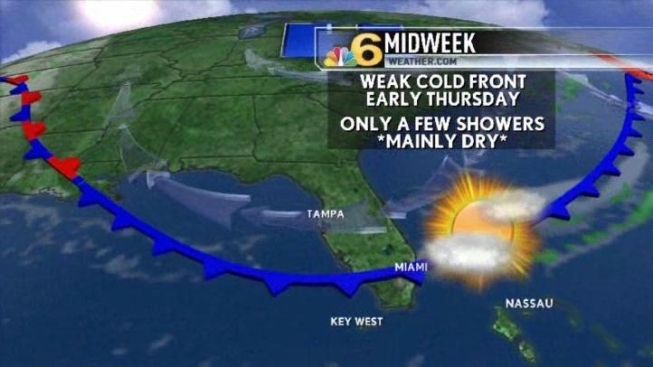 A few showers may develop along a weak cold front as it moves through South Florida Wednesday. The moisture will remain limited, so showers will be few and far between. Temperatures will fall by just a couple degrees to seasonable morning lows in the upper 60s and highs in the lower 80s by late week.